Last week I lamented the loss of cheap, convenient color film processing and wondered whether I should learn to process my own film. 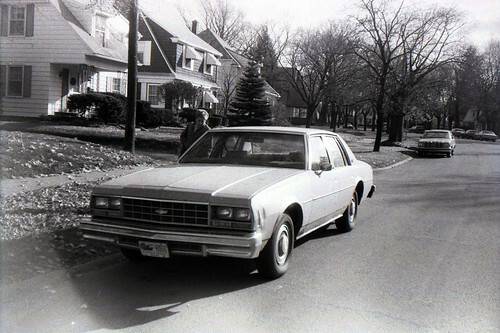 It got me thinking about the one roll of film I processed myself, way back in 1984. I was building my first camera collection by scouring garage sales and antique stores. I bought most cameras for a dollar or two; five dollars was my upper limit. I wanted to shoot with them, but film and processing were expensive. 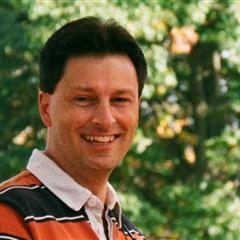 I had two or three dozen cameras then, but I had put film into only my Kodak Duaflex II and my Kodak Brownie Starmatic. Later in the darkroom, I discovered that processing film is tedious and unexciting. I enjoyed making a contact sheet from the developed negatives – but as the images emerged, I was disappointed that only a few of them turned out. The rest were badly over- or under-exposed. I could not have imagined that almost thirty years later, modern technology would rescue most of these photographs. I used my film scanner to digitize them, and Photoshop Elements to cover my exposure sins. This is where I went to high school. The building was torn down about 15 years ago. I remember not being able to back up enough to get the whole building in the frame, so I took three shots from left to right and figured I’d lay them in series for sort of a poor-man’s panorama. Unfortunately, I double-exposed one of the shots, nixing the idea. But this, the first shot in the series, was accidentally relatively well composed. I also shot my elementary school, which was renovated and expanded a few years ago. Unfortunately, that project laid a driveway across the front of the building, which led to that great tree’s demise. That didn’t damage my warm feelings toward this building and my happy years as a student here. This blue spruce stood in the corner of our yard until it died about 20 years ago. It was enormous! I couldn’t manage to squeeze it into one frame without backing up so far that half the neighborhood ended up in my shot, too. So I took three photos of sequence of it, and all of them were overexposed. But Photoshop Elements fixed the exposure and Autostitch made the three images one. This tree was a local landmark and I’m so glad to have this good photo of it now. 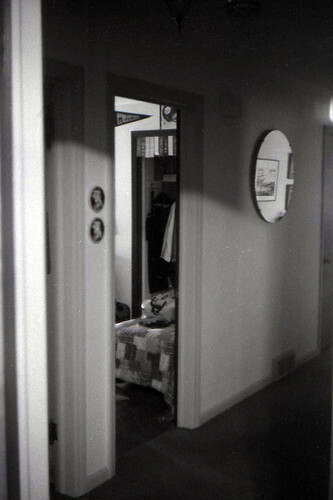 Standing in the doorway of my childhood bedroom, I opened the aperture wide and hoped for the best in this shot. That’s my brother’s bedroom there. The round mirror came from the 1899 Oliver Hotel in South Bend just before it was torn down in 1967. It has hung in that spot since 1976. I even tried some night photography on a very late walk home from a school event. 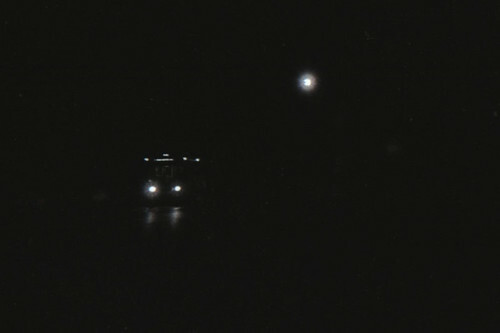 A city bus route ran along my street; this was probably the last run of the night. It’s heading southbound as it passes under a street light. I am proud of my 17-year-old self for trying this. Here’s the same street during the day. This is my friend Karen and her car. She used to drive me home from school every day. 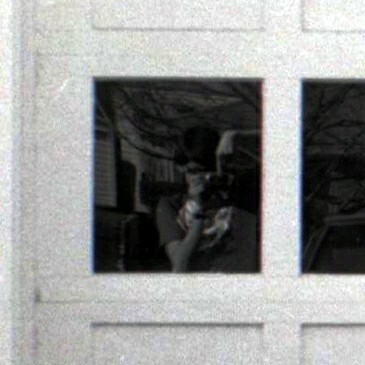 One last shot, this time a close crop of an otherwise throwaway shot in which I found a reflection of myself. 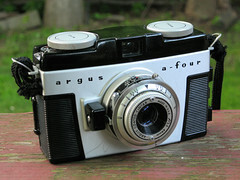 I remember well the fussy shutter button on that Argus camera but not my dorky-looking technique for getting it to fire. I am amused that I took all of these photos within walking distance of my childhood home. 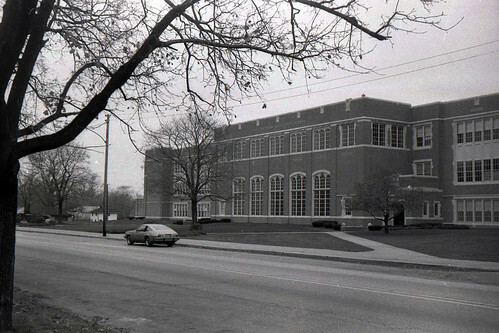 The high school stood at one end of our eight-block-long street, Erskine Blvd., and the elementary school stood around the corner from the other end. Every other photo comes from Erskine Blvd. itself. Such a small world I had in 1984. I love old photos, especially treasured old ones. Those photos of the cars are fantastic. And I adore the reflection of the younger you in the window. It makes me rethink all the “crappy shots” I’ve thrown away over the years. I suppose everything gets better with time. Thanks for stopping by this morning! Thanks Renee! It was such a joy to see these images come to life. The night photos restored a memory I had lost. That’s the great thing about old photographs. It’s so great that technology could repair those old photos. 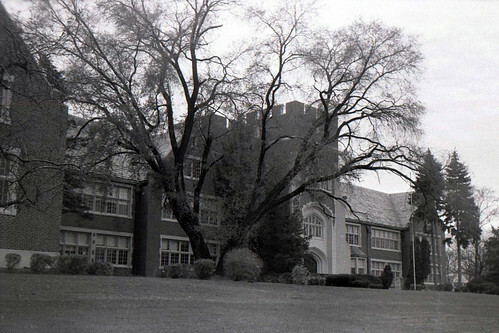 I wish that I had simllar photos of my old house and school. I remember it used to be a lot more fun when I first photograph. Used to only focus on the fun factor, and as long as something showed up, its good enough. Time passed it’s getting less and less “fun”, however I still enjoy doing it a lot. I do miss those days though. – it is because secretly I’d like to do that myself. F8 and be there! Man I wish i could revert back to that simple way. I do this for the fun. With every new camera I try I discover something new, and that’s where the fun is — it’s what keeps me going. When the new things stop coming, that’s probably when I’ll start to lose interest. That’s how it goes with me for everything I do. I have learned a great deal over the past few years about exposure. Sometimes, shooting with a box camera brings back that simple innocence that I had when I began shooting my old cameras several years ago. Some wonderful old photos. Do you ever find that sometimes when you see a photo of something that you haven’t seen for a while that it looks somewhat different than how you remember it? I still tend to think that there is no better way to learn about photography than to have some cheap bulk film and a camera that just has the basics. I do find that. The tree photo is one of those. I remember the tree being wider at the bottom. I mowed under it enough, you’d think I’d know. If I had kept going with that a-four back then, with that bulk film and school-darkroom processing, who knows how good I’d be today. And it works! Especially in this age of Photoshop, where you can so easily fix so much. Love the memories Jim :) I have two vintage cameras yet to open up: a Spartus 35mm, and a Werra with the hood intact. I have a couple yet-to-shoots too but nothing that interesting: another Canon AE-1 Program and a Yashica T2 point-and-shoot. At the moment, I have film in a Pentax H3, my Argus A-Four, my Yashica-D, and my Ansco B2 Speedex. It’s too bloody cold to shoot any of them outside!